The Renegade Seamstress put out an alert on a stellar deal on a dress form, today only (August 1st). So I researched it and determined that I was going to get the deal. I called the store just before taking my lunch and confirmed that they had the form in stock. They had one left. She’s patiently waiting in the car for the workday to end. 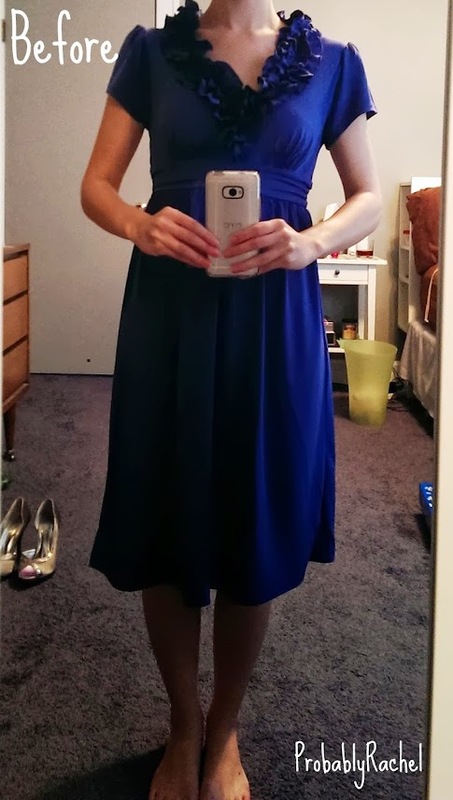 I got this short sleeve, blue ruffle dress new for a whopping $8 to wear for Easter. I wore it on Easter, neglected to get a picture and wasn’t thrilled. The sleeves were just okay and didn’t quite feel like they fit quite right. There wasn’t anything wrong with the dress, just a little eh in the sleeves and possibly overwhelming in the ruffles. I could call this refashion: the time my husband thought I was making lingerie. Since graduating from college, I’ve gotten a bunch of my stuff that my parents had been storing for me. I really didn’t bother looking through it because it was stuff I’d lived without for four years. After we bought our house I started organizing, sorting and getting rid of things. I started with a scrap of hot pink lace. When I held up my finished project and showed Brad, he asked me if I had made lingerie. I didn’t take a before picture (oops!) but honestly it was a reasonably sized rectangle of pink lace. I folded it over so that the scalloped edge would be the bottom hem of my shirt (my goal was a shirt by the way). 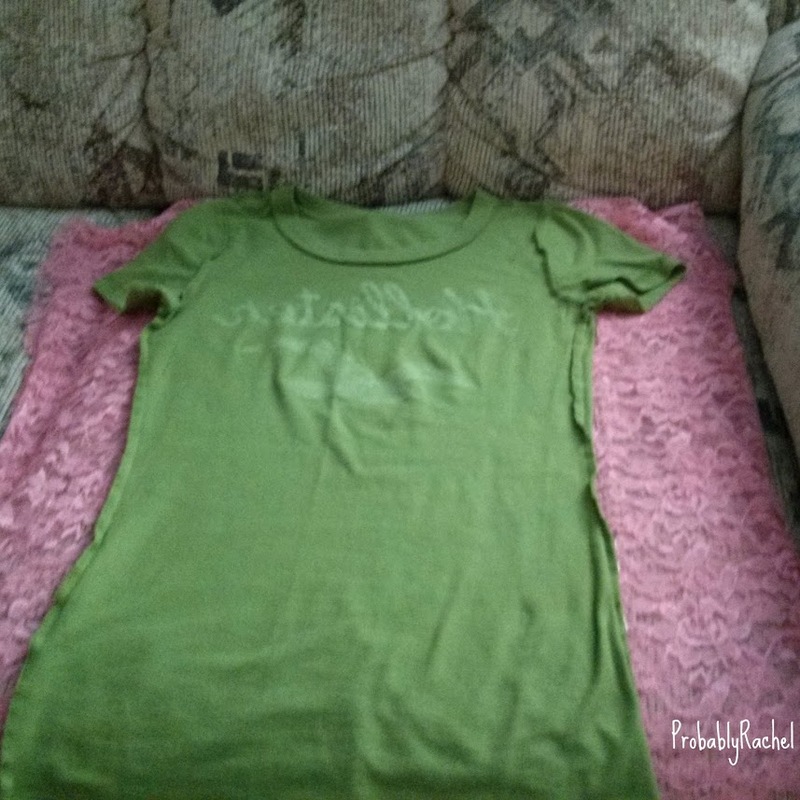 I cut a simple neckline, then pinned the lace to a t-shirt that fits me well. Using the green shirt as a guide, I pinned the sides and arms then cut the lace, leaving extra room to fold the seams. I folded over and stitched them down. I angled the sleeves creating a little bit of a flutter. Only on a rare occasion will you hear me call a cardigan a “cardi” I think it sounds a bit odd. But anyway, I love cardigans. I’m more likely to be found wearing a cardigan sweater instead of a traditional sweater like my light pink sweater… that may or may not have been purchased in the girls’ department several years ago. I liked the pinkish, peach of the sweater, the pearl details and its soft look but I didn’t really wear it very much because I’m not a fan of pulling static-inducing sweaters over my head.